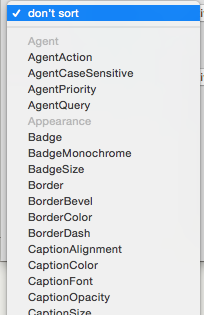 This menu is used for the 'sort by' and 'also by' pop-ups on the Action Inspector's Sort sub-tab for Notes, Agents and Adornments. The first sort value is stored in $Sort and the second in $SortAlso. User attributes are listed first, then the various system groups. The Internal and HTML system attributes are omitted for brevity as they are unlikely to be used for sorting. However, attributes from the latter sets can still be set via a stamp or the Info view.